Im as guilty as any computer-savvy teen of sprinkling my writing with the abbreviations and shortcuts that are popular in email, online chat, IMs, and text messages. To be honest, these shortcuts dont bother me because I like to think that I know enough about language use to avoid any embarrassing slips into emoticons, acronyms, and abbreviations in rhetorical situations where they dont belong. The NCTE Beliefs about the Teaching of Writing explain that “Just as the nature of and expectation for literacy has changed in the past century and a half, so has the nature of writing. Much of that change has been due to technological developments, from pen and paper, to typewriter, to word processor, to networked computer, to design software capable of composing words, images, and sounds.” Part of this change has been the development of abbreviations for the words and phrases used in digital messages. As children and teens learn to use digital tools to communicate with others, they adopt the language of the Internet—its abbreviations, diction, and grammar. Numbers and symbols replace the letters that they resemble. You could write the term “leetspeak” as “!337$p34k”. The character “!” replaces the letter L, “3” replaces E, and so on. Other examples of character/letter replacement might include “8” for B, “9” for G, and the number 0 for the letter O. Whatever the Internet language you explore, you will find very specific rules in place that govern diction. Sometimes, as is the case with leetspeak, the rules are playful substitution that creates a special code. Other times, the rules have to do with technological limitations. Many shortened word forms and abbreviations result from the limited length of text messages. If you can use “b4” for the word before, youve saved four characters. Nonstandard capitalization springs from similar roots. Typing a capital letter in a text message requires two keystrokes (one to turn on caps, one for the letter), so writers opt for the faster lowercase version of the words if the meaning will not suffer. Consider the Internet abbreviation “LOL,” which stands for “laugh out loud.” In a cell phone text message, the all caps version could take up to six keystrokes, while the lowercase takes only three. In the frequently high-speed communication of text messages, writers are more likely to opt for the lower number of keystrokes. Beyond diction and conventions, there are clear grammatical rules at play in the use of Internet slang and communication. A fun example is lolcats, images of cats (like the illustration above) that include playful captions that invoke a grammar all their own. Anil Dash has outlined some of the underlying grammar rules of the lolcats in his blog entry “Cats Can Has Grammar.” The grammar of lolcats includes attention to verb tense, pronoun use, and sentence construction. 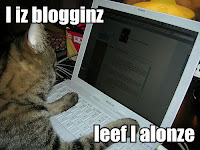 In fact, lolcats require multimedia literacy skills, as writers combine image with caption and follow conventions for font appearance, caption placement, and overall layout. Their observation fits Internet language well. Articles like the Hartford Courants “R T33ns KO'ing Eng?” begin with the notion that there is or may be something wrong with writers use of emoticons, acronyms, and abbreviations in digital messages and texts. In truth, its not error. It's just language in use in new and creative ways. The best thing teachers can do is take advantage of this language play and explore the ways that words and phrases and clauses work in the different kinds of language that we all use. READERS: Please take a second after reading to share some immediate feedback by clicking the comment buttons below that reflect your reaction to this entry! Im always trying to improve the blog, and your feedback will help me make sure Im meeting your needs. The Standards for the English Language Arts describe and clarify what students should learn in English Studies and Language Arts—reading, writing, speaking, listening, viewing, and visually representing—to be literate in today’s world. This expanded definition of literacy occurs at a time when classrooms are more culturally diverse than ever, when technology and cyberspace bid for schools’ attention and dollars, and when employers are calling for more and more highly skilled workers. These challenges make our jobs tougher than ever, yet we return to the classroom every year, knowing that the joys outweigh the challenges. Annual Convention Speaker Jonathan Kozol, featured in this weeks Boston Globe story “Schooled in Persistence: Kozol Still National Conscience on Education,” speaks to some of these challenges in his new book Letters to a Young Teacher, in which he “gently guides a first-year teacher into the joys and challenges and passionate rewards of a beautiful profession.” As I thought about Kozols mentorship of the young teacher and the challenges we face as we enter the classroom, I was inspired to share a story of my own. I remember in particular William’s light bulb moment. My first-year college comp class in Spring 1993 focused on the ways that the writer’s perspective affects the meaning and language of a message. Students read pieces by Jane Tompkins, Harriet Jacobs, and Alice Walker, and we talked about how writing takes place in a social context. I asked the class to do some fairly complex and sophisticated thinking, and their writing showed that they were struggling a bit with the task. One day in the middle of this course, William was slow to gather his belongings and leave, so I asked him if he had a question. He stepped up to the desk and said, “I’ve been watching some of the TV about that thing in Waco. You seen it?” He was referring to the ATF raid on the Branch Davidian ranch near Waco, Texas, and the subsequent siege that was still underway there. “I was writing about it in my journal,” he continued. “You see different reports and stuff on different channels.” I nodded, and he went on, “When they talk to the witnesses, they say different things about it and it has to do with what they care about. That’s just like those things we’ve been reading. That’s what you’re talking about, right?” A light bulb moment! He didn’t know it, but William had had a light bulb moment as he wrote that journal entry and made the connections between what he had been reading and current events. Williams light bulb moment remains one of my fondest memories of teaching. As we re-enter the classroom this fall, I hope we all have more joyful moments than challenging ones. If you have stories of joys from your teaching experiences, please share them in the comments. Every teacher loves to read of classroom successes! As we head back to school, we face the challenge of building eclectic groups of students into engaged literacy communities. Once the icebreakers are over, what do you do? One great solution is to launch a collaborative inquiry-based writing activity that gets students involved with one another. Working in small groups, students can get to know a few others well and can build strong classroom communities as they explore, create, and reflect on their inquiry task. What better activity could you hope for in the first days of school than one that encourages creating new ties and strengthening existing ones? “Thematic Strands for Studying Community” from the opening of Writing Our Communities describes five different aspects of community that inquiry can focus on. “Sharing Stories to Build Community,” Chapter One from Writing Our Communities by Linda Hadley Stewart, invites students to share a memorable childhood incident as a warm-up activity for deeper community explorations. Walt Whitman as a Model Poet: “I Hear My School Singing,” a ReadWriteThink lesson by Writing Our Communities contributor Patsy Hamby, asks students to create their own poems after exploring the community at their school. Although published as a secondary lesson plan, the activity to be adapted for younger students. Connecting Past and Present: A Local Research Project, a ReadWriteThink lesson by Writing Our Communities contributor Linda Templeton, casts students as active archivists—gathering photos, artifacts, and stories for a museum exhibit that highlights one decade in their school’s history. "Dear Mrs. Duits, The food is so yummy and yummy. But there are one proplem. It is the green beans," wrote Zhong Lei. "We love the rest but we hate the green beans," wrote Viviann Palacios. As a result of their letters, the food service department of the Clark County School District talked to the students, had taste tests, and agreed to tweak the cafeteria menu. Writing . . . should not be viewed as an activity that happens only within a classroom’s walls. Teachers need to support students in the development of writing lives, habits, and preferences for life outside school . . . . As much as possible, instruction should be geared toward making sense in a life outside of school, so that writing has ample room to grow in individuals’ lives. The students who took on the “lunch lady” at William V. Wright Elementary learned more about persuasive writing than any amount of test preparation could have taught them. Preparing students to write persuasive letters for standardized tests is meaningless compared to teaching them to compose letters for an authentic audience and purpose with concrete outcomes they can understand. When writing matters beyond the classroom walls, students become better writers. Thats the best kind of student writing!